From here, you have two paths to take. First, getting all lazy during the syllabus week and slightly regaining your focus. Second, plunging in first to be one step ahead of others. We strongly recommend you choose the second one and thus take control of the entire semester to come. So, how do you do it? We have gathered a few tips that might help. 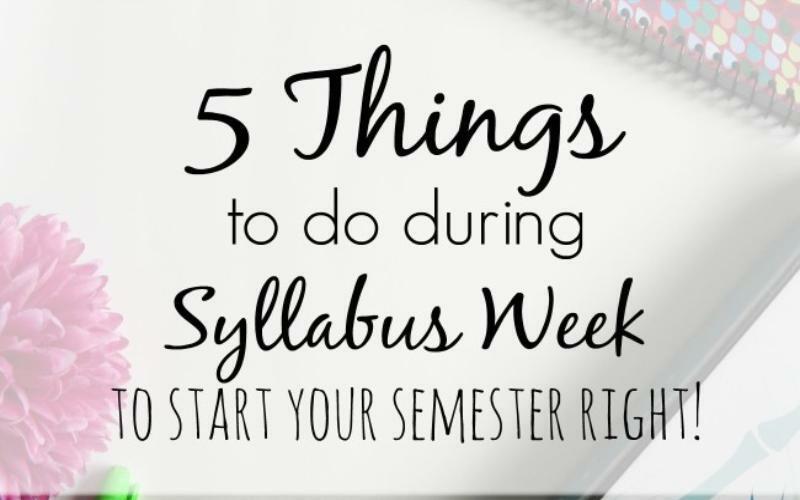 Professors may very well start assigning papers, reading, and projects during the syllabus week, and it increases your chances of success to have all the books you need. You are not only ahead but in fact you are behind the class as soon as the assignment is given and you don’t have the book to fulfill it. And if no assignments were made, you can use the book to review the material in advance and thus be better prepared for future classes. It is always important to pay attention during classes but these first ones are no less than crucial. It is when professors give you the orientation and tell you what you will be learning during this semester. Clarify things that you didn’t understand and make sure you have a clear idea of what will be required from you during the semester, including all kinds of possible assignments. Most professors announce in advance when you will be assigned homework, papers, projects, etc. By marking all of these dates in the calendar, you will be able to manage your time much more effectively. Plus, no assignment will come as a surprise. Experience proves that knowing when to start working on your assignments can improve your mark by roughly 30%. It is easy to get lost in your classes and new professors. That’s why you should try and stay organized. Keep materials for different classes in different folders and color code them for convenience. Actually, only you know exactly which organization method works best for you, only the result matters. Before the semester is in full swing, take time to set up things in your residence hall. This way, when it starts to get hot (academically), you won’t be distracted by inconveniences.